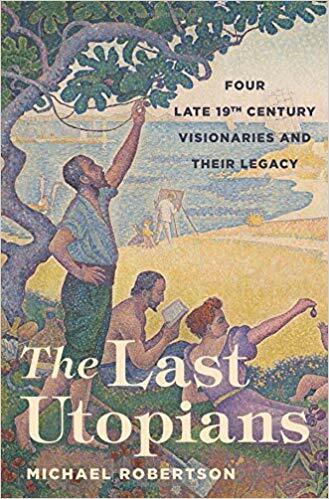 The strangest thing about Michael Robertson’s The Last Utopians is its title, which would seem to suggest that there have been no more utopians since the days of the four figures he chooses as his subjects: Edward Bellamy, William Morris, Edward Carpenter, and Charlotte Perkins Gilman. In fact, as Robertson well knows, our world remains full of utopians, though they don’t always describe themselves that way anymore. As he makes clear in a seemingly self- contradictory postscript titled "Utopianism in the Twenty-First Century," Robertson sees the utopians of today as inheritors of the "legacy" of his four — as a way, perhaps, of keeping fresh their relevance to our own times, which might otherwise appear to be obscure, to say the least. For even more curious than his misleading title are the author’s constant attempts to disguise or palliate what would be instantly apparent to most of us if we went back to the books by Bellamy, Morris, et al. themselves, instead of reading his secondhand account of them: namely how laughably bad they are. The task of utopian literature has always been to provide an excuse or a pretext for people to believe in what would otherwise be unbelievable, but such pretexts tend to wear out rather quickly — as more recent ones, mostly based as they are on swiftly obsolete technologies, should warn us. This stuff dates, in other words, and if we look back to the utopian literature of the 19th century, it takes a very special kind of naïveté to find anything remotely believable about it. And yet even today people find their reasons for believing. The historian E.P. Thompson, for instance, looked upon the idealized Middle Ages of Morris’s News from Nowhere as an exercise in "the education of desire," by which he presumably meant education in not desiring — or not desiring anything that postdates the Wars of the Roses. But the books are bad not only in the sense that they are poor predictors of the future, which arguably they weren’t trying to be anyway. They are also aesthetically bad: badly written, badly plotted, and with badly drawn characters as remote from ordinary experience as only those made to illustrate a utopian thesis can be. They do not look like real people but like specimens of some alternate version of humanity that has never existed and never could exist and therefore come across as literally inhuman. True, it’s hard to see the lives of the Robertson Four on quite the same heroic scale as Wilson’s Karl Marx, though William Morris comes close — mainly because he produced other work that was more interesting and valuable than News from Nowhere. But the attempts to connect these interesting things with the wasteland of banality that is utopia are not often persuasive — as when it is said of Morris’s wallpaper designs that they "are imbued with a utopian desire for harmony with nature that suffuses his work in every medium." Since when is "harmony with nature" utopian? The trouble with utopia is precisely that it is not in harmony with nature — especially with human nature. Typically, utopians get around this awkward fact by denying that there is any such limiting thing as human nature. Well before Marx posited his idea of man as a mere product of historical and economic circumstances, Robert Owen established his "Owenite" communities in the belief that "human nature would be transformed" by them. Focusing on the hopeful future thus becomes a way of forgetting the failures of the past. Any history of utopianism is fraught with paradox, since utopians can hardly be utopians without first abolishing history — or claiming it, as Marx did, as their own property, which comes to the same thing. The past is not only an irrelevance to any projected future utopia but a positive danger, since unless it is constantly rewritten, as in Orwell’s Nineteen Eighty-Four, it serves as a reminder both of the failure of past utopias and of the fact that the future never turns out the way we expect or plan for it to do. Here again, the idea of the Victorian utopians as having a legacy in the present strikes me as paradoxical, since utopianism by its very nature imagines a wholly new start to the nation, or even to the species, which would necessarily turn any history that might otherwise be ours into a kind of anthropology: a study of alien but merely primitive and untutored societies belonging to an entirely different order of humanity — a hard case to make when the supposedly real people are only imaginary. Robertson reports that William Morris criticized Bellamy’s hugely popular Looking Backward for only going halfway with change and not recognizing that it is "modern civilization" itself that was responsible for all the evils he thought could be extirpated from his medieval dreamland. Robertson would seem to concur when he writes that Bellamy "suggested that once class differences disappeared, everyone would naturally conform to Victorian middle- class norms." Yet Gilman’s feminism in Herland and Carpenter’s idealized homosexuality and what Robertson calls its "appealing post-Christian mystical spirituality" represent avowed breaks with the past as well as providing Robertson with a link to present-day assumptions that allow him to take even the most bizarre of utopian manifestations seriously. He doesn’t acknowledge that such assumptions must cut him off from the past he is ostensibly adumbrating. When he writes, for instance, of "social justice" in the Utopia of Thomas More or of "gender ideology" and "gender anxiety" in Victorian times, he does not hint that such concepts were quite unknown to the people who allegedly embodied them in their lives or works. How far can he be said, then, really to be writing about the past, and how far is he projecting 21st-century ideas onto the past in order to give them a kind of pedigree? Robertson makes no bones about his own utopianism, which may not make him the best person to write this history, and he makes the usual utopian’s assumption that a better world means an utterly transformed world, although the transformation may be, for the moment, only on the scale of the various hippie communes he has visited or Occupy Wall Street. After paying due respect to Karl Popper, John Gray, and Frédéric Rouvillois ("All utopias are totalitarian. . . . And, conversely, all totalitarian states are fundamentally utopian"), he goes on to give "my own definition" as "the envisioning of a transformed, better world," which, though he admits it may also be applied to Stalin, Hitler, or Pol Pot, is assumed to be "crucial to shaping a better future." His own ideas seem to have been inspired by Davina Cooper’s Everyday Utopias, which sees utopianism as a way of "engaging with spaces, objects, and practices that is oriented to the hope, desire, and belief in the possibility of other, better worlds." Consider for a moment that use of the word "worlds" and its plural number — as if worlds were as plentiful and as easy to be picked as blackberries. Back in Victorian times, people had some excuse for utopianism, which had not had very much in the way of a real-world tryout at that point. Now it has. Now we have no excuse for an easy faith in other, better worlds, as opposed to slightly improved versions of this one. This must be why other utopian theorists tend not to look to the past but to disguise their utopianism as "progressivism." But towards what are they progressing if not utopia as they conceive it? Robertson himself quotes Martin Green as comparing the late-Victorian period to a British "New Age" — a reminder, if any were needed, that utopian schemes for the redesign of society are constantly being rediscovered and recycled in some putatively more plausible form than those of their discredited originals. That is what he himself turns out to have been doing in The Last Utopians. If only they were the last!